Our children are supposed to lose us one day when we grow old, just as we are to lose our own parents when they grow old. We aren’t supposed to lose our own child. That is just not the right order of life. It’s not how life should go. It just isn’t. What it is, though, is the most devastating emotional pain a person can experience, of that I have no doubt. And no, I haven’t yet experienced that pain, though many I know have. But yes, one day I too will know that pain first hand. Today, my local SN community of families was rocked by a sudden passing of a beautiful little girl. This angel I last saw a few weeks ago as her hospital room was just around the corner from my son Brendan’s room. I can’t find the right words to describe how utterly stunned I was hearing the news this morning. But not just me. There isn’t one of us in our SN community that doesn’t feel genuine heartbreak when one of “our” angels gains his or her wings. We love one another’s children immensely. We have a bond that is woven tight by strands of fire-tested strength. And, we know we too will be there…one day. We reach out with love, prayers, words of comfort. We light candles. We post “our” loss on social media to pay tribute to the angels we lose and in attempt to share this grief, hoping others can understand the anguish in our special community. Privately, we fall to our knees when no one is looking and we sob, often uncontrollably, as another angel transitions…as another angel gains wings for flying with all the others who left before…and who will be waiting with pure love when it is our angel’s time. There is something else we say, and we actually do, after one of our angels transitions. We Hold On Tighter to our special angel. We literally, physically, lovingly, and dare I say with a hint of fear, hold on tighter. And then more tears fall. Tonight I tucked my Brendan Bjorn into his bed and after holding on tightly, I kissed him on the cheek and told him to send kisses to the angels. And I have no doubt that he will. We probably won’t help you move, but…we have boxes! Part of this journey having a child with a life-limiting illness involves finding humour along the way. In fact, I’ve found it needs to be a BIG part of the journey to help counteract the seriousness of the daily life. We have very stressful, busy, exhausting lives, you see. So, when it comes time for you to move house, dear friends, we most likely won’t be able to help you move. We’re sorry, really. Between not having anyone capable of minding our fragile child, to our backs that barely move as they should, to falling asleep at random moments, well, we probably just can’t. We’d love nothing more than to be free enough to help, though. But wait, we aren’t a lost cause!! No, in fact we may just have exactly what you need for your move! 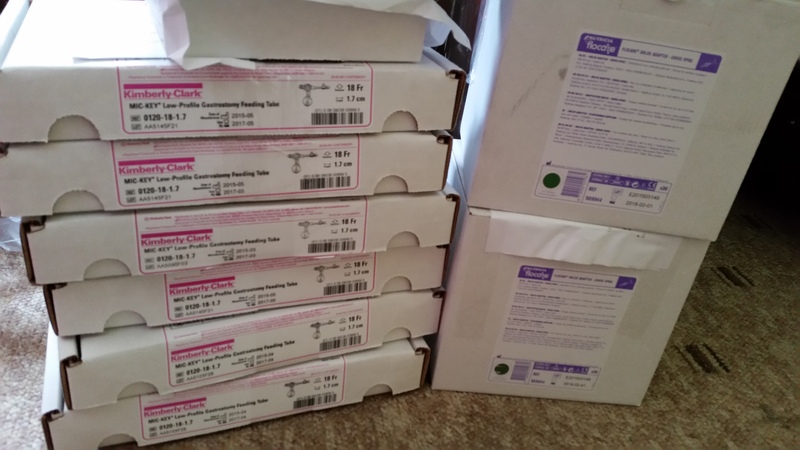 And I mean all kinds of boxes – tiny, small, medium, medium large, large, extra large! You name your size and tell us how many you need and we will GLADLY unload…I mean, kindly let you have…some of our stock. And as this blog is about the journey, after all, you should know our houses generally look like a warehouse. 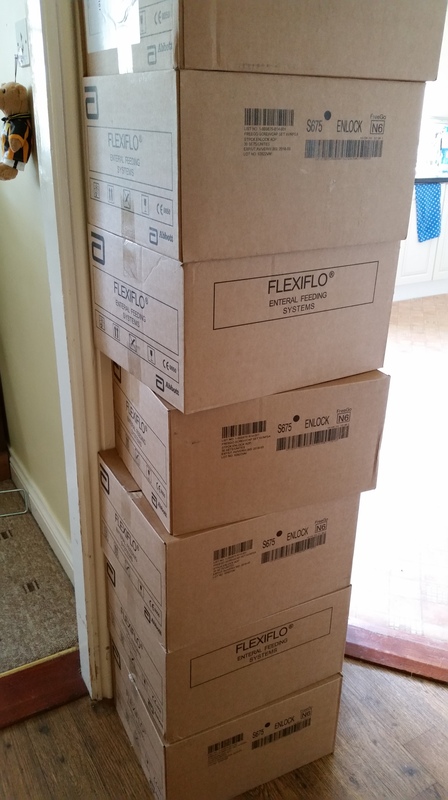 When you walk in the door, you may be greeted by a stack of boxes filled with feeding line supplies or nappies stacked taller than you are. Don’t be too intimidated. We’ve stacked them just right so they won’t fall over on you. Or when you enter the sitting room, you may discover that you are actually not sitting on a couch, but rather on a cleverly disguised and brilliantly situated row of supply boxes covered with the most fashionable of blankets. And here you thought we weren’t good at decorating, didn’t you? Ha! Bittersweet. 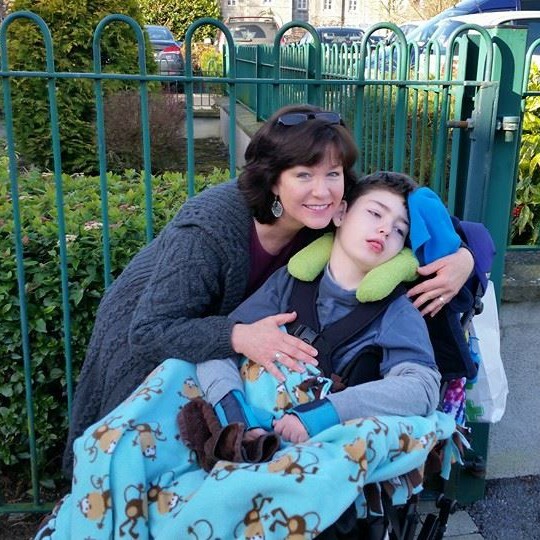 If I had a penny for every time I used that word over the past 11 years on this journey with my son who has a life-limiting illness, I would probably be a millionaire. And I know I’m not the only SN parent in these shoes who uses the word to so aptly describe how we frequently feel when a special occasion comes along for our angel. Take for example BIRTHDAYS. Now while many of our family members and non-SN friends cannot fathom how we could ever be so ungrateful as to use the word bittersweet to describe our angel’s birthday, let me say for myself (and I dare speak for many other parents out there): Get over yourself and don’t ever refer to us as ungrateful because we feel “pleasure tinged with sadness or pain” at such an amazing milestone as our angel making it another miraculous year. Please. And thank you. That in 8 days my son turns 11 years old and I am still looking at infant toys for him. And that will never, ever change. That as he grows more fragile, he is less able to even attempt to play with those infant toys. 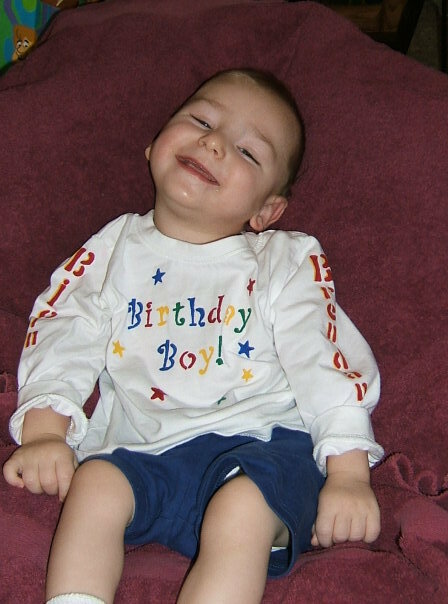 That I don’t know if this will be his last birthday on this earth, so I wrestle with how to make this the most special one yet without making him too tired or overwhelmed. That a traditional birthday party where friends are invited over has never happened, and in fact he’s sat there in his wheelchair waiting while no one invited bothered to arrive…and so parties with “friends” were no longer attempted. And so it is – pleasure tinged with sadness or pain. This journey is infused with the taste of bittersweet. It is just one of a myriad of emotions along the way. 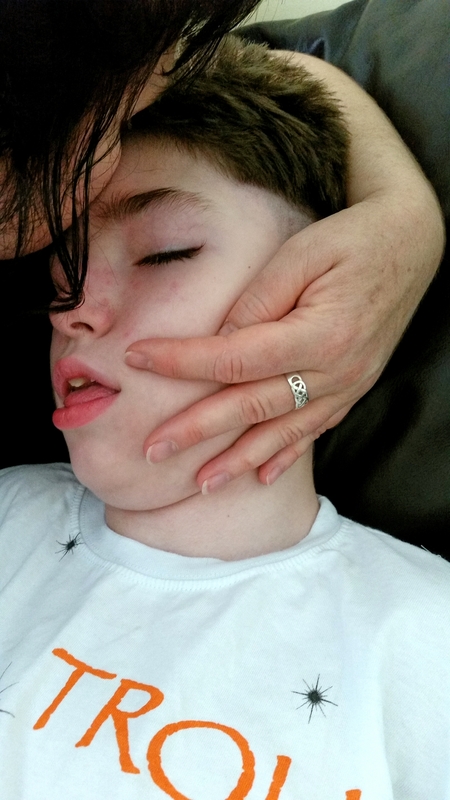 We aren’t an easy group, us parents of children with a life-limiting illness. We see the world differently than most people, most of the time. Our perspective has been forever changed by knowing we will one day be seeing our very own precious little child gain his or her angel wings. Knowing the order of life is reversed. Somewhere in the often dark recesses of our mind, we carry this understanding with us at all times. Many of us, in an unconscious attempt to preserve future sanity, begin the grieving process now while our angel is still alive. You may find us at times speaking about how we know our child will die…and you will likely be left with your mouth hanging open, if not literally, at least figuratively. Just hold on to something to steady yourself and know we are reeling far more than you are inside. You may find us at times crying for apparently no reason at all…and you won’t know what to do or say. Just hold us. Hug us. Reach out to us. Just be present. But whatever you do, don’t run away from us. You may find us talking nonstop because we haven’t spoken in days to another adult about something not related to our angel. Just let us talk. You may find us desperate for social interaction, because the truth is we don’t get out very often. And those of us like myself that are a single parent, we really never get out very often! Just accept that hint that we want to come see you or the outright invitation for you to come over and visit. Please. It isn’t easy being friends with “one of us” at times. I am willing to bet, though, that you will not find a friend more willing to fight for you if ever you need it, because we are always prepared to battle. I am willing to bet, though, that you will not find a friend more ready to be your shoulder to cry on when you experience a loss, because we live with loss daily. And I am willing to bet, though, that you will not find a friend more excited to see you, share a cup of whatever you have, and laugh as loudly as we can, because we crave just being a friend and being who we are in those moments we are with you. No, it’s not always easy being our friend. This is one tough, heart-wrenching journey we are on. But I can tell you most confidently that being our friend will be worth it. If you aren’t strong enough, then that is alright as well. Move on. You won’t be the first friend that has walked away. We need strong friends to surround us to help us stay afloat. So to all of you who are our friends, the most heartfelt thanks and love to you! Thank you! Now, when shall we get together?